On the crux of Ring of Steall 8c+, on the way to the actual crux! I have been enjoying good sessions in fine conditions on my project at Steall. My objective was just to get a sequence I was happy with before I leave for Switzerland. But It’s gone better than I expected. 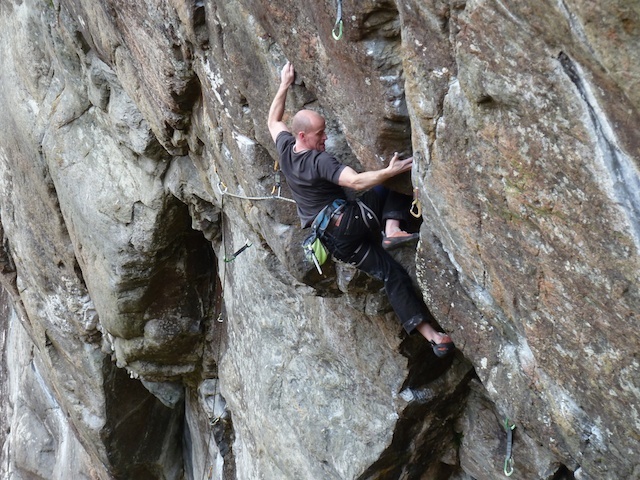 On the last session I linked from the block after the Ring of Steall crux to the top. This rather brutal section of climbing revolves around three big moves in a row. Each of them used to feel pretty damn hard in isolation. But on my second link they felt pretty solid. 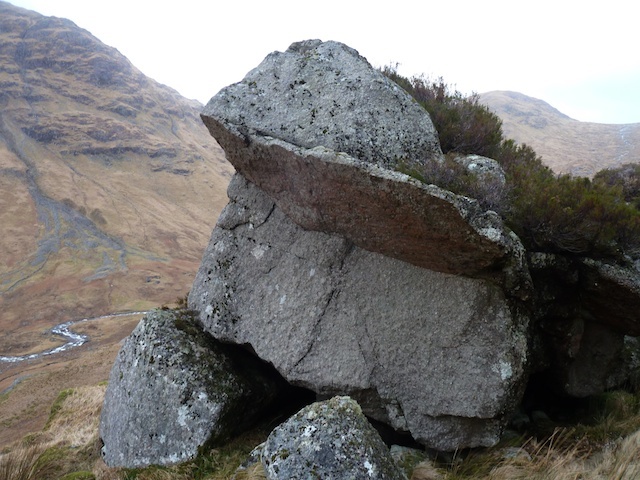 It’s taken a bit of time to re-learn the subtleties of the Ring of Steall crux. But I think I’ve got it again now. But I’m still a good bit away from the pre-requisite of managing to redpoint through it every go! I still think the egyptian move must be one of the best moves on British rock. Easy if you do it perfectly, impossible if you are even slightly out of the right body position. I’m definitely feeling some momentum of a good run of training and can’t believe I’ll be in Switzerland next weekend! First up, more STEEEAAALLL! Michael getting the workout on my own route Steallworker, 8b. 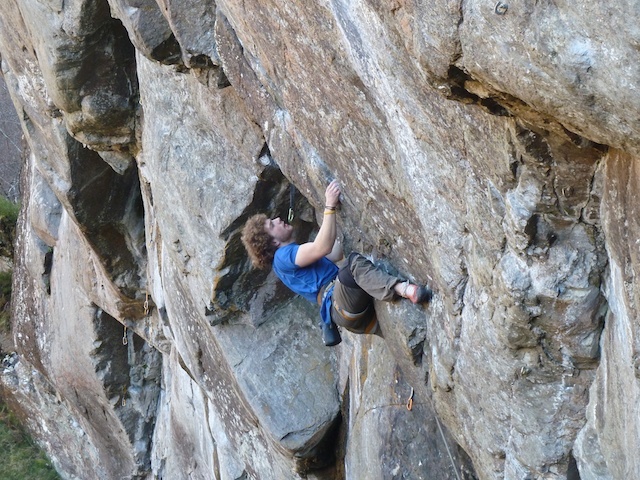 Greg Boswell working on Leopold, 8a. A great three days at Steall with Michael and Greg. The first morning started grimly wet after 24 hours of heavy rain. All the streams were in spate, and that was just the ones coming down the crag. Nevertheless we worked our moves and got sequences dialled on our respective projects. Today the sun was out and spring was well and truly in the air for the first time. The crux of my project was still seepy, so it was simply time to put in the reps on the first half. To get steely strong and fit on the moves. This bit is both hard and easy. Sore fingers, pumped arms and tying right back in for another burn right after you lowered off. On the other hand, there’s no stress. Hard work is not scary on it’s own. You can’t lose; just put in the hours in the knowledge that the big progress happens right here, not on the eventual redpoints, which are just the very end of the process. In the last week I’ve gone from bouldering strong with zero endurance to almost getting through the crux of Ring of Steall 8c+. It’s a great start, but just a start. I have some killer beta for the crux, but could do with a bit more. The bit above Ring of Steall gets properly hard. It feels good to be able to rep the easy lower part without getting pumped. But to even get close to redpoints, I’d need to be doing the same on the upper half. I couldn’t even imagine that right now. About a month or maybe six weeks of uninterrupted power-endurance training on the right sort of terrain will be needed. Soon I’m leaving for a long trip with a fair bit of bouldering. So I’ll rack up some more sessions on the crux, and hopefully get a confidence boosting link before I go. While I’m away I can continue to build up some iron crimp strength and the sort of fitness you only get from trips. Exciting stuff. Finally a break in the rain and some decidedly unwintery weather in Scotland and it was time to venture up to Steall for the first time this season. I had a quick session on my project which although obviously still felt sick hard, I could do the moves straight away so it was nice to get a first taste of the effects of the winter’s training. After that I decided to look again at a direct start to Stolen that I bolted last year. I had thought the first three bolts would be 8b+ in themselves, with the meat of Stolen to do above that. But a small block had fallen off making a slightly better foothold just where you need it. After a couple of tries, I did it! Since I’d only had one quick bolt to bolt up Stolen and hadn’t tied onto a rope for a looooong time, I didn’t think I’d have the endurance to carry on to the top without a couple of sessions learning how to be a route climber again. There was a bit of puffing and panting, but I got there without too much stress. My base level of strength does seem not too bad. A good place to start for the project. The direct start to Stolen might be 8b or 8b+, not sure so we’ll say 8b/8b+. 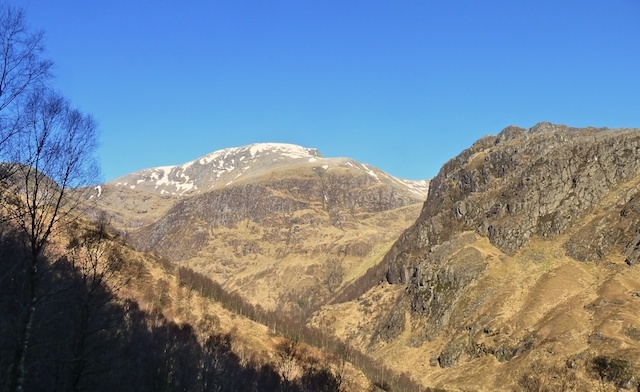 Episode 5 of the Glen Nevis Walks podcast talks about the Gaelic names of the Ben and the Mamores range with Gaelic historian Ron Cameron. Mick Tighe tells about his north face lowers on Ben Nevis, being lowered on a 1000 foot rope to find stuck ice climbers somewhere in the night below. John Muir Trust ranger and climber Ali Austin tells us about some of the wildlife in the Glen which I must say constantly amazes me. Enjoy. It’s right here. And on iTunes here. By the way if you are into putting something back, you could join myself and a small group of other folk doing a clear up in the lower part of the Glen around the curling ponds on Friday 23rd March. Details here. 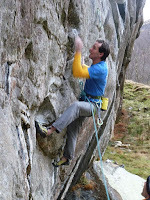 The other day, I mad a massive breakthrough on the Skeleton Boulder roof with the ‘2 halves’ link. I couldn’t quite believe it happened after seeming so, so far away. It’s quite strange how a few different strands of progress combine to propel you forward such a long way. 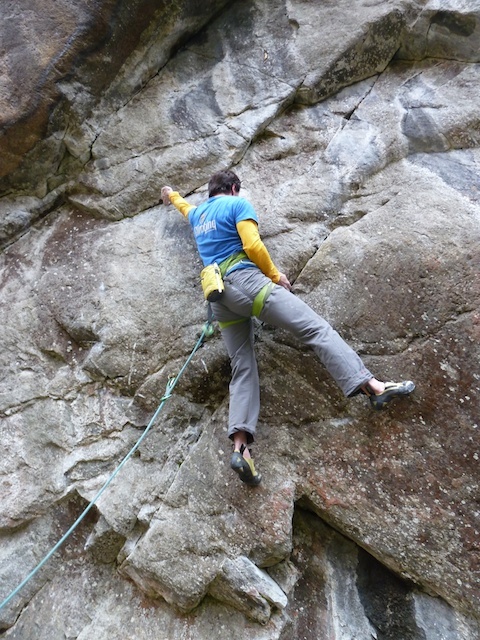 Although I was pretty sure that a poor kneebar was the right beta for me to get through the crux, I was desperate to sort out something for my left foot to put myself in balance and with a stable base to slap the pinch on the lip without my feet cutting loose. Out of a lot of options, I’ve finally homed in on a sequence that I’m sure works for the whole link. The catalyst was losing a couple of pounds last week and a good stint of sessions on different boards. I has simply improved my strength/weight ratio enough to feel what the solution would be. You might think ‘why didn’t you get light earlier’. I don’t think that would really have worked. Short of a drastic weight loss, which would be seriously counterproductive in the longer run, I wasn’t ready to trim up until now. I needed to put in the hours on the line first, getting stronger on the moves and homing in on the best sequence for most of the moves. Now I feel good and confident on many of the moves, and since I’m starting to round off my fitness state with a pound or two lost, I’m getting closer to thinking about going into link mode and really going for some big attempts. I did actually climb from the start to the crux too, so you could call it overlapping halves. But I wasn’t tight enough on the third move to get my knee pulled right up to the best bit of the kneebar, so it doesn’t count. That can be my immediate goal now. The buzz of the breakthrough link from the second hard move to the top kept me up for most of a night. Pointlessly starting to imagine rest day/redpoint day planning despite the crazy Lochaber weather, which if I may say has been irritatingly crap. The feeling of having made an irrefutably clear breakthrough in strength and climbing ability isn’t something that happens all the time, except in the easy first couple of years of climbing where you just have to show up to get stronger and better. I’m aware of how special it is. So the prospect of trying to build on it and adding three more moves onto the start of my link is a little scary. But I’m sure I’ll get over it. Hill running was always a discipline I couldn’t get my head round. For the last ten years or so I’ve done a little every year, for one reason alone - to lose weight for hard rock climbing. Left to it’s own, my body settles at a stocky build well too heavy for anything harder than 8c. So a couple of times a year, I tend to do a bit of running to get in shape for something hard in sport climbing or bouldering. Although it doesn’t even come close to the enjoyment I get from almost any type of climbing, I still enjoy running for a few different reasons. When I lived in Dumbarton in the mid 2000s and was training to get strong enough to climb Rhapsody, I used to do my fingerboarding and endurance circuits each day and then go running on the streets late at night. I used to use it to switch off and remind myself why I was doing all this training. I wasn’t doing the run in a particularly scenic place, so the enjoyment was purely internal. At that time, I used to think of hill runners as crazy. It just seemed so hard and relentless. How could you ever be fit enough to be able to enjoy it. Only later I understood how slowly hill runners (except the real pros of course) run uphill. Now I live in the mountains I enjoy running primarily for the scenery and terrain. A great formula for me has been to use my runs to explore potential new bouldering spots in the more remote highland glens. 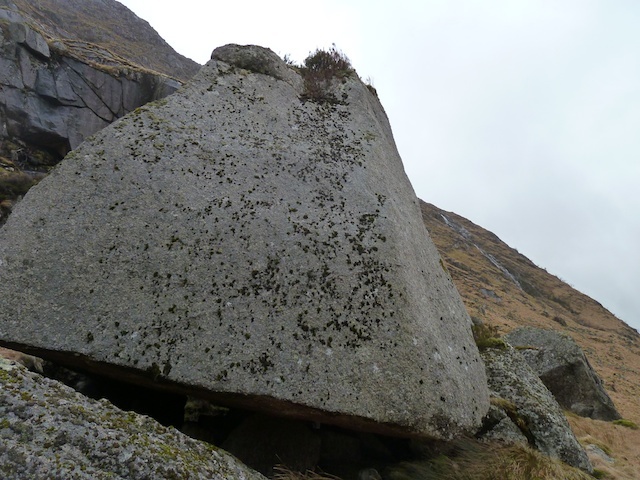 Sometimes there are great boulders, sometimes there is just nice scenery and weather. Either way, it is enjoyable and answers a curiosity. 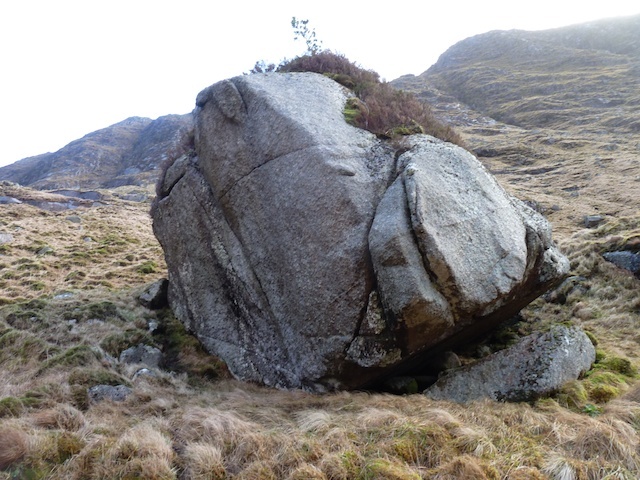 Nice big boulder, a few good easier climbs to go on this. I particularly enjoy these hill runs if the terrain itself is quite technical; rough paths, rocky ridges or slabs and even some scrambling. I don’t think I could ever sustain long runs on open trails, forestry tracks or roads since having experienced the hill running in the Scottish Highlands. Wild mountain areas all over the world have this opportunity to explore really interesting mountain terrain, unfolding I front of you as you move quickly through it. Running the other day in Glen Ceitlin on my first run of the spring season, I was reminded that the feeling of running on open mountainside (apart from the real uphill parts) is like floating. It takes so much concentration to move at speed between rocks, tussocks, holes and over streams without falling over. Yet it is not thinking - just immediate, subconscious reaction to the movement sequence demanded from split second to second. Despite having to focus hard, your conscious mind has the chance to sit back, relax and enjoy being there. Hill running suddenly makes sense when you think of it in these terms - a feeling of flying over the terrain with little conscious effort. It’s obvious really that it would have to hold an enjoyment that was very strong, to be worth all the hardship that goes with it for those who do it all the time. Proper training for top performance in any sport has it’s fair share of grinding hard work doing boring exercises for the rewards. Hard climbing training, despite it’s hardships (lactate, finger skin destroying circuits and repetitive finger strength exercises) still probably has nothing on endurance running in this respect. It’s true though that such feelings are fleeting. Just as I was floating along, dreamily pondering these ideas while running back down Glen Ceitlin, I misjudged the consistency of the bog ahead and dropped up to my knees in slurping peat porridge, lunging forwards with my momentum to land on my knee on a granite boulder beyond. After rolling around, clutching my knee and moaning for a few minutes, I limped off down the glen. Brought back down to earth. 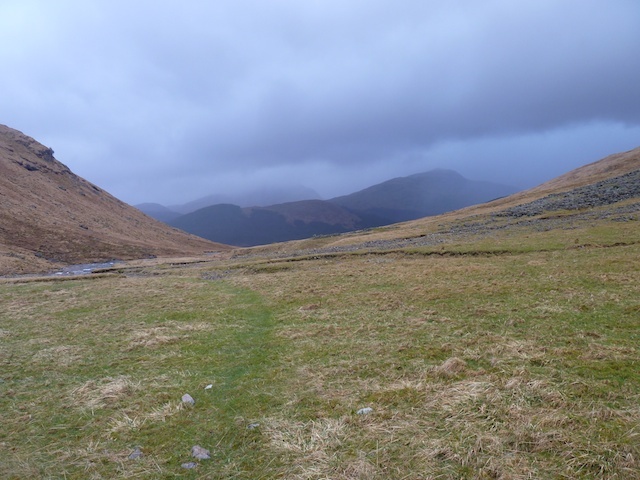 Episode 4 of the Glen Nevis Walks Podcast is up now on Friends of Nevis here and on iTunes here. This episode takes us through to Steall and the most dramatic bit of the glen. 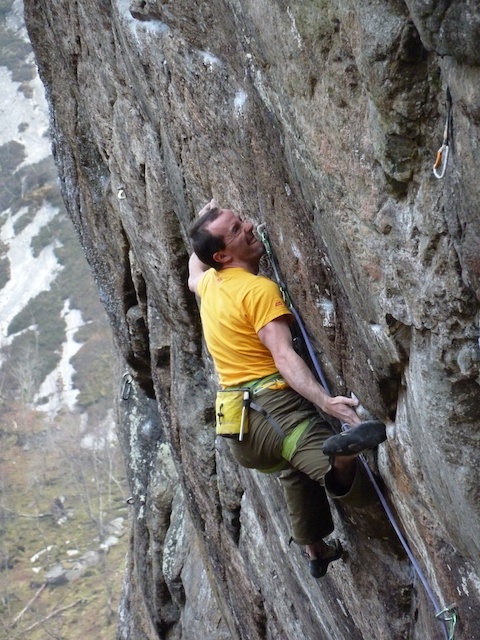 As usual there are stacks of good interviews but you climbers might be particularly interested in Kevin Howett’s rather worrying description of taking 60 foot falls onto an RP1 and breaking his ribs during the first ascent of Chairoscuro E7 6b in the gorge. I made the second ascent of Chairoscuro, onsight, in 2010, 23 years after Kev’s ascent. So listening to him describe the lonely upper arete brought back some strong memories for me too! We’ve also made a couple of videos of the interviews contained in our Glen Nevis Walks podcast series. They’ll give you a taster of some of the interviews in the episodes. The first is geologist and climber Noel Williams describing the fascinating and unusual geology of Ben Nevis and it’s volcanic caldera.